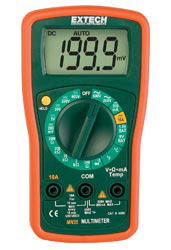 Digital Multimeter features eight functions. This meter measures AC/DC voltage, DC current, resistance, temperature, and continuity. It features a battery test and a diode test. The meter is shipped fully tested and calibrated and will provide years of reliable service.